Polio is back in the news. Almost forgotten for decades in the US, it has been brought back into the spotlight by the anti-vaxxer movement—but for millions around the world, especially those who have residual or late effects of polio, this virus has never been old news. 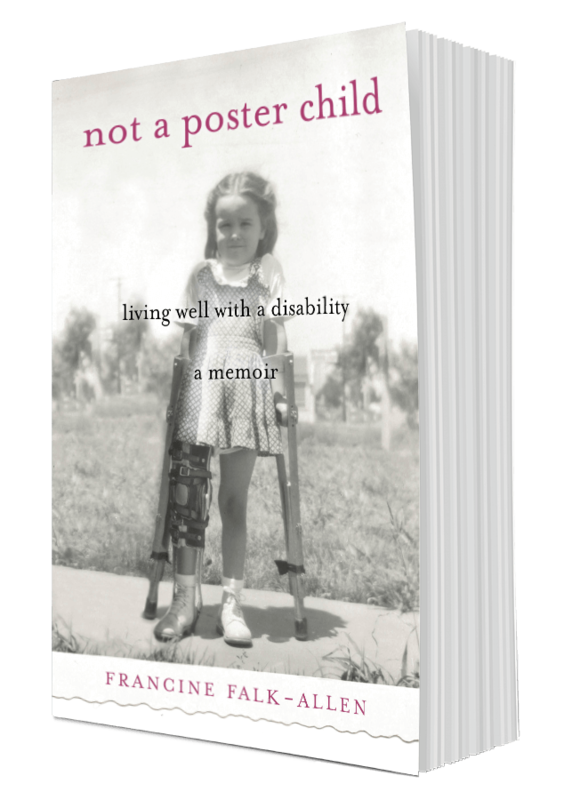 Francine Falk-Allen was only three years old when she contracted polio and temporarily lost the ability to stand and walk. Here, she tells the story of how a toddler learned grown-up lessons too soon; a schoolgirl tried her best to be a “normie,” on into young adulthood; and a woman finally found her balance, physically and spiritually. In lucid, dryly humorous prose, she also explores how her disability has affected her choices in living a fulfilling (and amusing) life in every area—relationships, career, religion (or not), athleticism, artistic expression, and aging, to name a few. A clear-eyed examination of living with a handicap, Not a Poster Child is one woman’s story of finding her way to a balanced life—one with a little cheekiness and a lot of joy. Kirkus Reviews, Starred review, Of the 8,000 - 10,000 reviews Kirkus does yearly, ten percent receive a star.